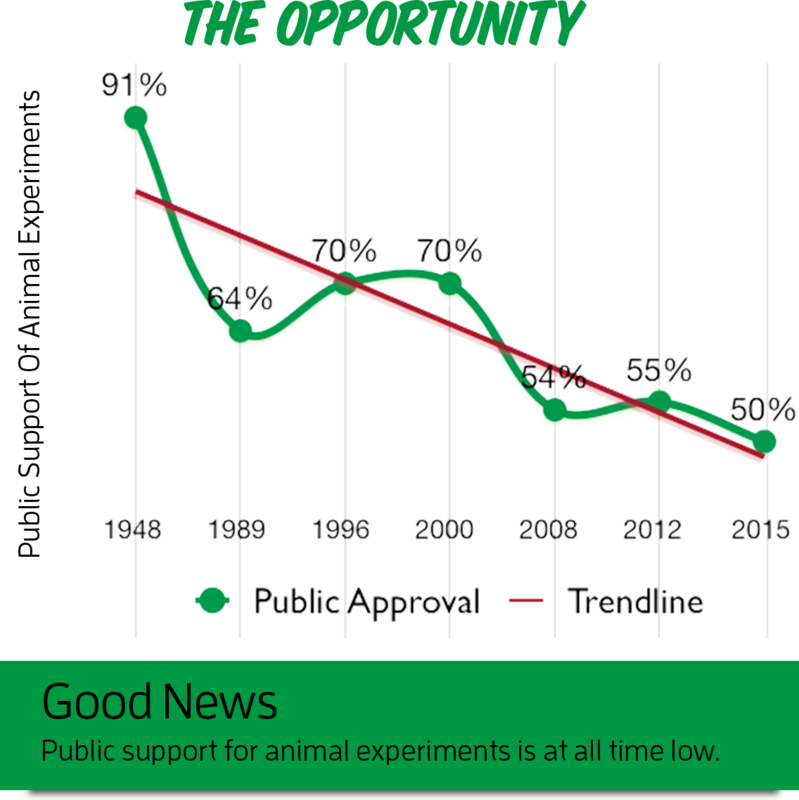 When one thinks of animal rights activism they generally think of extremist groups on the left, but a new group is taking the lead from the right in the fight against taxpayer-funded animal experimentation. The organization points out that the vast majority of “wasteful, duplicative, and cruel animal experiments are paid for with taxpayers’ money — and without taxpayers’ approval.” They also note that the problem is so massive that nobody really knows how much money our government is spending on this form of testing — or how many animals are used and killed since there is nearly no transparency regarding these programs. To solve the problem, White Coat Waste hopes to shine a bright light on the more than $15 billion that goes into these studies each year and pressure the government to defund the wasteful projects — which would save the animals. “The White Coat Waste Project’s team of seasoned issue advocates, scientists, doctors and political strategists combines grassroots tactics, media campaigns, diverse coalitions, open records laws and lobbying to shake up how and how much government spends on wasteful animal experiments. We’re the only group focused on bringing together waste hawks, science advocates, animal-lovers and liberty-lovers to cut spending that hurts animals,” the organization’s website reads. On their website, the watchdog group outlines some of the absolutely absurd and needlessly cruel experiments that our government has funded. The disheartening list includes stuffing hamsters with pizza and wine grapes to “increase the commercial value of the grapes and other specialty crops,” spending $10 million to address “lab mouse gender inequality,” and spending $2.9 million to force monkeys to run on treadmills for a quarter-mile a day — for a study which was already also being tested on human volunteers. Retired Marine Staff Sgt. Johnny “Joey” Jones, a Fox News analyst, told Big League Politics he is working with the organization to stop animal testing at the Department of Veterans Affairs. Jones said the program was very unsetting. “It’s especially shameful that VA is defending spending millions of tax dollars to buy and cut up dogs for its dubious research but refuses to provide service dogs to support veterans suffering from the devastating effects of Post-Traumatic Stress Disorder and who are committing suicide at alarming rates,” the Marine wrote. “So here it is: As a combat wounded Marine who’s given both legs for an idea of security and a pursuit of happiness – and as a human being who’s experienced the horrific suffering of war — I believe our government can and should do better for veterans, taxpayers and dogs,” he wrote. The VA is currently the only agency conducting “maximum pain” experiments in which significant pain is inflicted on dogs and left unrelieved.” Only three of their facilities are still engaging in this form of experimentation. Current experiments, according to White Coat Waste, include giving six-month-old hound puppies heart attacks, drilling into beagles’ skulls, and severing “friendly” dogs’ spinal cords. Jones, who lost both his legs above the knee after stepping on an IED while heroically clearing a minefield in Afghanistan, explained that White Coat Waste is starting with the VA because the private sector has moved past animal testing. Jones explained that the people who are involved with and support their organization are dog lovers — which is why trying to defund the testing at the VA is their top priority. The majority of schedule E — maximum pain and pain without relief — occurs at the VA labs. VetsFirst, The American Military Retirees Association and The Retired Enlisted Association have all come out in support of ending painful testing on dogs and moving the funds to programs that will actually help veterans. Earlier this month, the groups penned a letter to Rep. Dina Titus (D.-Nev.) and Rep. Dave Brat (R.-Va.) in support of their efforts to stop the experimentation. Over the summer, they passed legislation to prohibit the Secretary of Veterans Affairs from funding medical experiments on dogs that cause significant pain or harm. Titus, Brat and Republican Florida Rep. Brian Mast also helped to introduce the PUPPERS Act, which would “prohibit the Secretary of Veterans Affairs from conducting medical research causing significant pain or distress to dogs” permanently. “The VA’s first priority should be caring for our veterans, not harming man’s best friend,” Brat said of the dog experimentation programs in a press release. POTUS’s daughter-in-law Lara Trump is a huge backer of the cause. In July, the long-time dog rescuer and advocate met with Brat to discuss the bipartisan bill and lend her support. The majority of veterans also want to stop the wasteful spending on the cruel tests. In a national survey conducted in September by the research firm PulsePoint, 56% of veterans and their immediate family members responded that they support legislation to end it. Last week, the White Coat Waste Project released a new television ad urging people to contact Congress and ask them to support the legislation that would permanently end the experimentation. More information about how to get involved with the group can be found at the Prisoners of Waste website.